You can read about the latest weed-science research being conducted at UC Davis, but nothing beats seeing it for yourself. That's why pest control advisors, chemical company cooperators, faculty, students and regulatory officials continue to gather at UC Davis each July for Weed Day, an annual tour of the vast array of weed-control field trials underway. 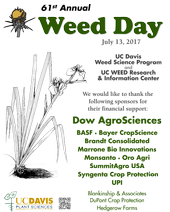 Here's a video (produced by Ray Lucas of UC ANR Communications Services) of the field tour of Weed Day 2017. First, we had fantastic weather, only getting into the 90s by the end of the tour and an excellent turnout with around 140 attendees. Vigilant Seed Bank Reduction: Whatever it takes, don't let weeds set seed.